The smartphone market is one of the most dynamic within the IT landscape. Five years ago Blackberry was still the most common platform. In 2017, we seem to have two players left. Apple with iPhones on their own iOS and a slightly wider range of vendors who are supplying smartphones with Android. 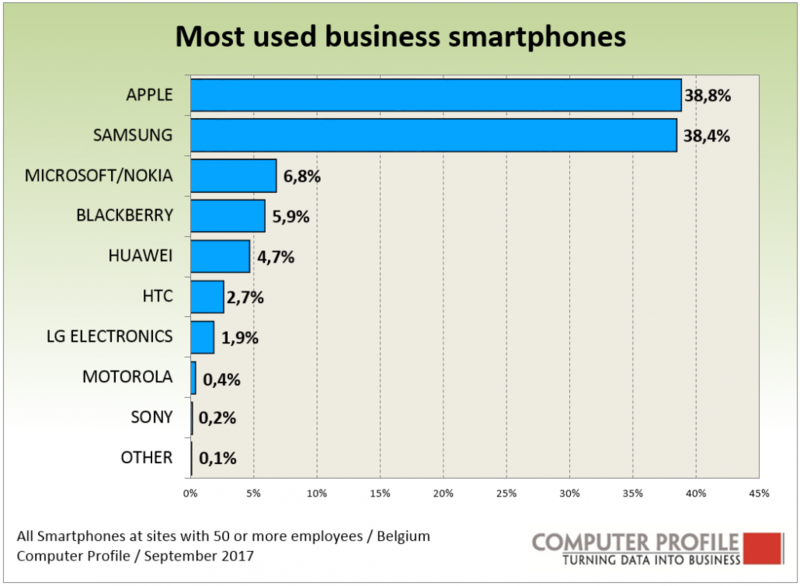 This year, Computer Profile is seeing the largest share of the business smartphone market being taken by Android on the business market (with 50 or more employees). Just under 48% of those smart phones are Android devices. The profit seems partly to come from the diminishing use of smartphones based on Windows mobile. Microsoft itself has not brought out any more new smartphone models on its own platform. 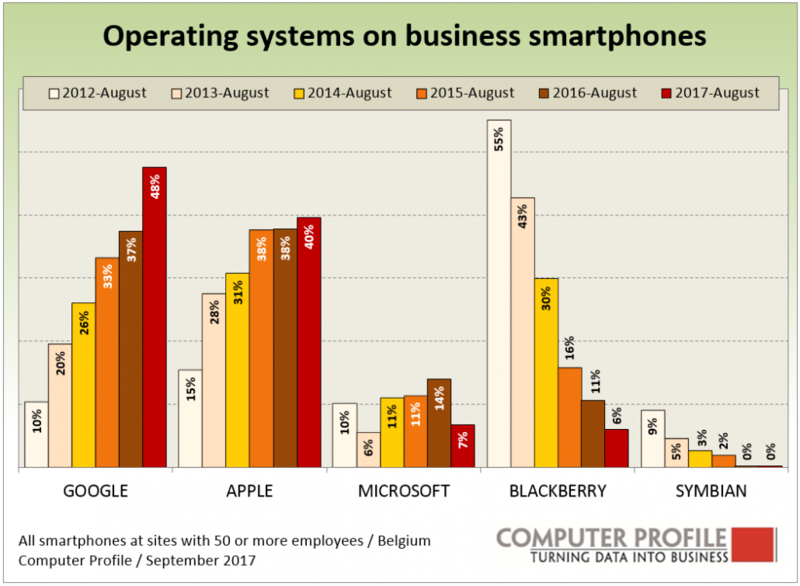 Nor have any new phones based on Windows 10 appeared on the Belgian (business) market from other vendors. Consequently, the share of Windows phones has halved in the past 12 months. About 40% of the business smartphone market is taken by Apple iOS devices at the moment. This has emerged from over 800 interviews which Smart Profile has conducted over the last twelve months among Belgian public and commercial businesses with 50 or more employees. There is, incidentally, a distinction between the installed base shares of the mobile operating systems shown in the illustration and the degree of dispersal of the various platforms. The former is a dispersal based on all identified smartphones, the latter on the use per platform per company branch. We are still seeing more locations with business Apple smartphones than those with Android devices. The number of devices per location is higher in the case of Android than with Apple. This gives Android the largest share in numbers of devices. We are still seeing Windows devices in one out of ten locations. Platform and brand of smartphone are in a number cases fully intertwined with one another. iOS only runs on iPhones, Blackberry OS runs (ran) only on Blackberry. For Android, and now to a lesser extent Windows phones, things are different. Most of the platform independent-vendors have opted for Android meanwhile. This also applies to Blackberry and Nokia. Both of these are now being made under licence by TCL from China and HMD Global from Finland respectively. Samsung is by far the most common vendor selling Android phones. In 2017, Samsung smartphones are running neck and neck with iPhones. For managing the smartphones (and the tablets and other mobile equipment not discussed here), organisations can make use of solutions in the area of Mobile Device Management. For a couple of years now, the use of this software has been included by Smart Profile in its interviews with Belgian business end-users. 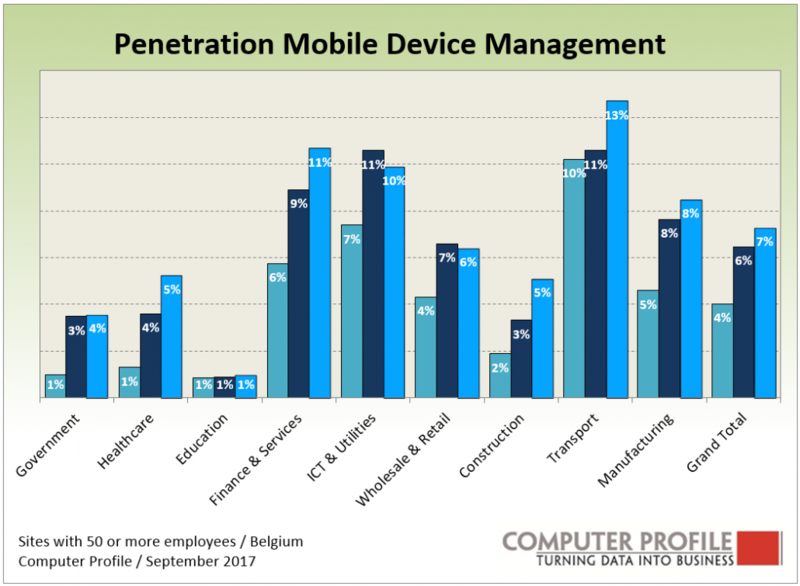 Strangely enough, we are not seeing many changes for the Belgian market in the use of mobile device management. Its use seems to be increasing only in dribs and drabs. The transport and services segments score the highest with usage of 10 percent or higher. The Dutch market is mapped out by Smart Profile in exactly the same way as the Belgian business market. At Dutch business locations we find that a quarter of them make use of mobile device management. 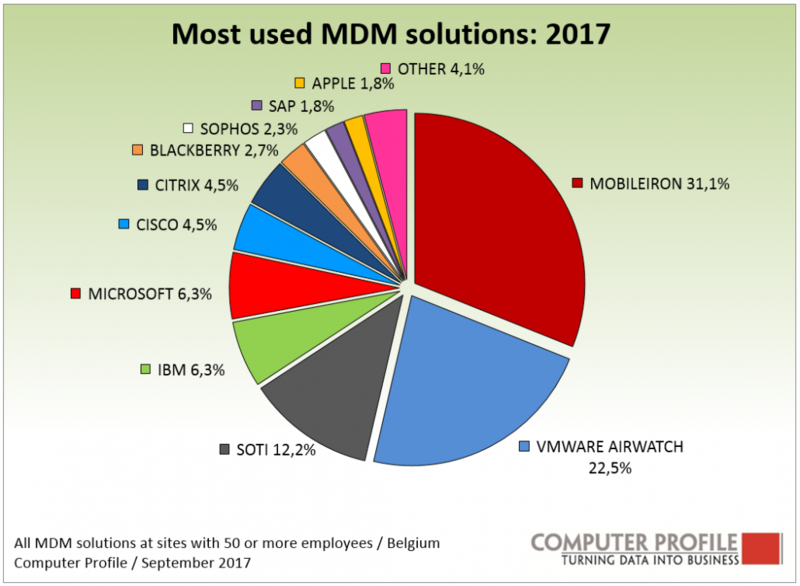 MobileIron is the most common vendor on the Belgian business market. Nearly a third of the solutions we found are by the American firm MobileIron. VMware Airwatch, also American, is at some distance number two, and SOTI (of Canada) number three. The positions of these top three have not changed compared with the two preceding years. For the other vendors too, we don’t see any major changes in their relative positions and in their current shares compared to the preceding years.